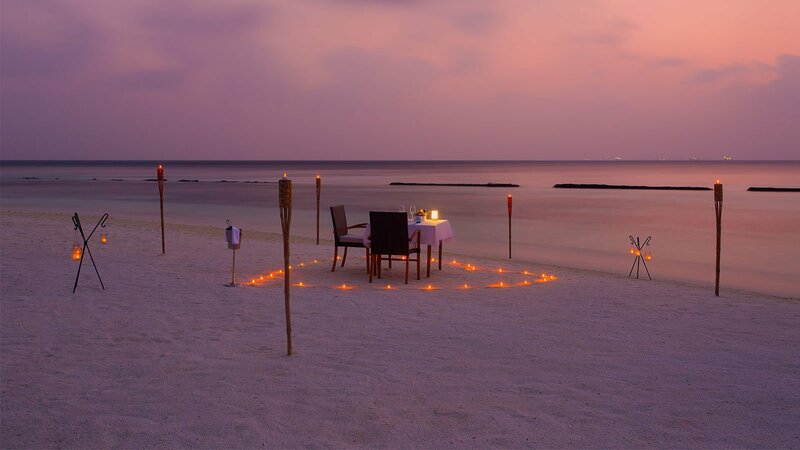 No holiday in the Maldives is complete without a romantic dining experience. Be it a candlelight dinner under a blanket of stars for just the two of you, a luscious barbecue beach dinner or dining in the comfort of your villa at your favourite time of the day, all your senses are bound to be delighted. Komandoo’s signature culinary event is the ultimate romantic dining occasion. Unwind underneath the stars, with your toes in the sand and indulge in a sensory delight that pairs exquisite food, great wine, privacy and a celebration of your choice. With sand between your toes and the gentle waves lapping nearby, these group beach dinners are a great way to spoil a loved one (and yourself of course) to a truly memorable experience. Make the most of your charming and comfortable villa and treat yourselves to a mimosa breakfast, champagne breakfast or a wine and cheese board to nibble on while enjoying the views from your terrace and in the company of the ones you love most. How to arrange private and beach dining? Your dining can be arranged upon your arrival at the resort, however if you already have a date in mind for your private beach dinner, it is advised you contact us to ensure there is availability; alternatively, if you wish to keep this a surprise, you can use Komandoo Gifts to make the necessary arrangements. Are you able to accommodate dietary requirements or preferences? Our culinary team offer a wide variety of options and are happy to accommodate any dietary requirements that guests may have where possible. My friends/family are staying at Komandoo and I would like to treat them to a private dinner. How do I make the surprise happen? We can help you discreetly plan a surprise for your loved ones. The most convenient options is for you to use Komandoo Gifts, where you can choose from a selection of experiences and book them online. Our team will make sure your dearest ones receive an attentive and friendly service on your behalf! Are private dining and beach dinners included in my meal plan? Private dining is not included in any of Komandoo’s meal plans, however, you may be entitled to a discount based on your meal plan. Please find current all-inclusive benefits here. May we take food from the buffet restuarant and enjoy it in our villa? Please use the extensive In-Villa Dining menu to order a meal to your villa.